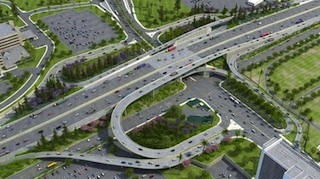 Metro&apos;s rendering of the completed Wilshire ramp "loops"
From the folks who brought you the marvel that was Carmageddon comes The Rampture—no, it&apos;s not a traffic-inspired disaster movie, but rather a nickname bestowed upon the several days of closures the eight Wilshire Boulevard on and off ramps to the 405 Freeway will undergo at various times in November. CurbedLA points to the new "threat" to our sanity, and to fears on the part of locals that November&apos;s ramp shut-downs could be worse than Carmageddon. Those fears are articulated on the blog of L.A. County Supervisor Zev Yaroslavsky—you know, the guy largely thought to be the genius behind the term "Carmageddon." Westwood Hills residents, as well as UCLA officials, are worried about the challenges these ramp closures will present to people needing to get in and out of the area. In November, construction will commence on two ramps, then move to the next two ramps and so on until work is done on all eight ramps. The ramps will be closed for 24 hours a day, seven days a week, for 14 to 90 days each. "The end result should be sweet: modern, swooping flyover ramps that will make it easier to navigate the notoriously jammed intersection," explains Yaroslavsky&apos;s blog. So will The Rampture defeat us? Hopefully not. Expect more contingency plans to be announced closer to the first closure dates. In the meantime, keep up with the latest on the I-405 project via Metro.